A month-long celebration of the Division Teachers’ Day commenced on October 4, 2018 at Cuneta Astrodome, Pasay City. Filled with excitement and gladness, teachers from the 19 Elementary Schools,8 Secondary Schools and 2 Special Schools gathered together to celebrate the said occasion. The event was graced by the City Officials headed by Congresswoman Imelda Calixto-Rubiano, Mayor Antonino G. Calixto, and the City Council. 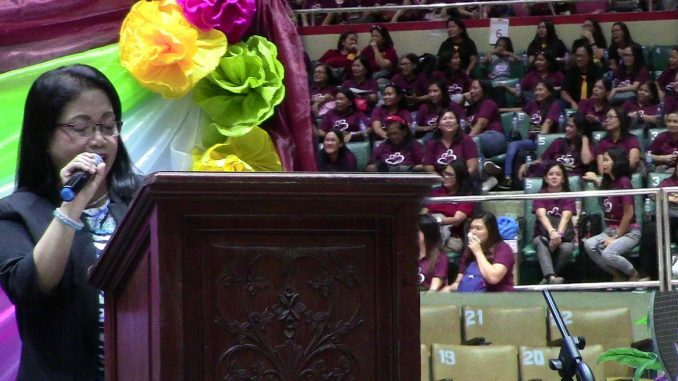 The Opening Remarks was delivered by Dr. Melody P. Cruz, OIC Assistant Schools Division Superintendent and the Focal Person of the Division Teachers’ Day celebration. Meanwhile, the Acknowledgment of Participants was done by Mr. Librado F. Torres, the Chief Education Program Supervisors. Meanwhile in her message, Congresswoman Emi Calixto-Rubiano disclosed that she valued the teachers and their efforts. As representative of the Congress she promised to extend help by conceptualizing pro-teachers house bills. She also urged the teachers to continue guiding their students to the right path. One of the highlights in the event is the awarding of Gawad ng Kagalingan winners and nominees. Hailed as winners are Dr. Myrna B.Gaza, Principal IV of Pasay City West High School for Gawad ng Kagalingan sa Pamumuno, Mr. Errol John Ruiz, MT II of Marcela Marcelo Elementary School for Gawad ng Kagalingan sa Pagtuturo and Ms. Ma Theresa G. Hilario, Admin Assistant II of Pasay City East High School for Gawad Kagalingan sa Paglilingkod. The awarding of winners in the concluded Division Sports fest also took place in the event. The major and consolation prizes for the raffle draws were donated by the stakeholders in private institutions while .Dr. Ladines, Congresswoman Emi Calixto, Mayor Calixto, the City Council, the Division Supervisors and the School Heads had given the cash prizes. The teachers were enliven to witness the showcased of teachers’ talents per cluster dubbed as “A Glimpse of Nobleness” for Cluster 1 and 2,” Highlights of Teachers’ Success” for Cluster 3 and 4,”Teachers’ Spotlight” for Cluster 5 and 6,”Teachers’ Shining Moments” for Cluster 7 and 8, “A Glance of Greatness” for Cluster 9 and 10 and the “Memoir of Leadership” the presentation of Faculty Presidents. The expenses incurred in the conduct of the scheduled activities for the Teachers’ month- long celebration was sourced from the Division MOOE. The T-shirts worn by all the teachers were funded from the LGU General Fund.